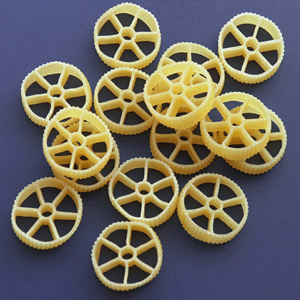 I frequently make wagon wheel (rotelle) pasta (Racconto brand and probably others) for my kids, but the shapes rarely stay intact. Pieces of the outer edges often break off of most pieces, and some wheels are completely severed in two. I noticed that pieces are already breaking apart during my initial constant stirring to unstick it from the bottom of the pot. I do stir it fairly frequently, especially at the start. I also use plenty of water--three or four inches above the pasta, about three quarts water and one cup pasta. What can be done to cook the rotelle and help keep it intact? Try starting with the pasta in cold water. This lets you stir it to wash the starch off the surface of the pasta while it's still completely hard, so you can't possibly damage it. Then it'll stick way less as it cooks, so you shouldn't need to stir nearly so much, and hopefully it's not breaking just from cooking. If you still have trouble with sticking, I suppose you could even remove some of the starchy cold water, effectively partially rinsing it. Some brands and shapes of pasta do seem to have more starch on the surface, so I could see that being necessary. You could also simply try using more water (but still starting with cold water!) so that the starch is more diluted; this is roughly equivalent to rinsing a little. And if all of that fails, you may want to try another brand, as suggested in various comments here. The fact that it breaks during the initial stirring, before it's had time to soften much, is not promising. For one more bit of evidence, simply starting with cold water even keeps orecchiette (dry, not fresh) from sticking - and that's by far the worst-sticking pasta shape I've ever tried. They fit together so that once they're stuck, the water can't even get in to rinse off the starch. If you're having to unstick it from the bottom of the pot even once, then you're making a fundamental error of cooking pasta and that's why your rotelle gets broken. The water should be at a roiling boil when you add the pasta. There should be enough water that the pasta you add doesn't bring it to a complete standstill. It should at least maintain a simmer immediately after you add the pasta. You should stir it right away to prevent sticking. You should let it come back to a roiling boil, stirring a couple times until it does so to prevent sticking. Once the water has returned to a boil and the pasta is moving around without sticking, you can turn down the heat a bit so it's at a vigorous simmer. But the water must keep moving the pasta. Don't let it sink to the bottom. You have already said that you stir it frequently, but the most important time to stir is in the first 60 seconds after you add it to the water. If the pasta doesn't stick to the bottom of the pot then, it is unlikely to stick later. While it is very feasible to cook pasta in reasonably small amounts of water, or even water that is not quite boiling, these methods require more attention and stirring. I like those methods, since less water to boil means faster time to dinner, but the price is that you have to watch more closely. If you are having trouble with sticking, you might want to make sure you are cooking in plentiful water at a full boil. The second likely cause is that you are simply overcooking the pasta, and it is becoming very fragile. The recommended time on the package from the vendor is often a good place to start, although there is usually some room for longer cooking if that is to your taste. I had about three inches of water above the pasta. Use way more water. Start with nearly a full stock-pot of boiling water to minimize the starch concentration in the water and eliminate sticking (you still need to stir for the first 60s). Then start with less water in future batches to find optimum amount. Some brands of pasta are lower quality (to my eyes glassy is undesirable, chalky is good). So you'll need to find optimum amount for each type/brand. I recall nearly 10 to 1 water to pasta by weight ratio. When I fix stuffed shells, I rinse my shells with cold water for two reason. One is to clean them. Second reason is to wash any excess layer of starches that may be on my shells. You can't get all off until you start cooking but you get the access off. I put enough water and just little more to make sure the water is cover all my shells. Then I add butter, not oil. I have found that butter works better for me. After it starts to boil I add my shells and stir for one to two minutes, then reduce the heat. I'll maybe stir one more time before my shells get to soft. If you try to stir when they are soft you might as well forget it because they more likely going to tear apart. After cooking I rinse my shells and fix them up. I don't know if this will help you or not but maybe your water is boiling too much for the type of pasta that you are fixing. I find that for those delicate types of pasta, it's best to bring the water to a boil, add the pasta and reduce the heat to a simmer, stirring just once or twice. The lower flame (or heat if you are electric) will help the pasta not stick to the bottom of the pot, the lower slower cooking allows the pasta to soften without being agitated by boiling water AND you don't have to stir (which can contribute to breaking). I talk more about the difference in this answer. The first ones, dry pasta, must be cooked with plenty of BOILING water; occasionally stir gently (not all the time) and drain it "al dente". If you cook them too much they break into pieces. The second ones are "pasta fresca di grano tenero". Form is as lasagne. They are cocked separately, let dry a bit, filled with a filling with eggs, rolled, cooked again separately for a few minutes wrapped tightly in gauze. Then they're removed from the water and cool. When they are cold, they're removed from the gauze, cut into wheels and arranged as shown, covered with a little tomato sauce and parmesan and gratined in the oven. Also, I am going to recommend something crazy, try boiling it in the microwave in a glass bowl. You just need enough about twice the amount water to pasta in size (not weight). The texture gets a bit weird, but the pasta always stays intact. Not the answer you're looking for? Browse other questions tagged pasta presentation or ask your own question. How to keep pasta hot, yet not sticky in crock pot?